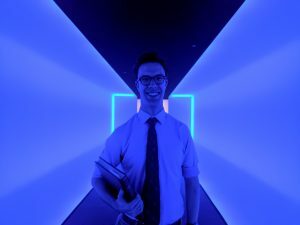 JP Peralta ’19, a major in Art History and Theatre, has been selected to be an educator and interpreter at the American Pavilion of the 2019 Venice Biennale. He will be working under acclaimed sculptor Martin Puryear on a team of educators representing the United States at this renowned international art fair. In addition to working with visitors to the American Pavilion, part of the job will also be comprised of performing work for local charities and women and children’s centers. This job is sponsored by the Arts Intern program, which seeks to offer students from around the nation paid experience in the arts. JP is the Curatorial Assistant to the Director at The Sculpture Center and one of the Teaching Assistants for the Saturday Art classes at the Cleveland Museum of Art. 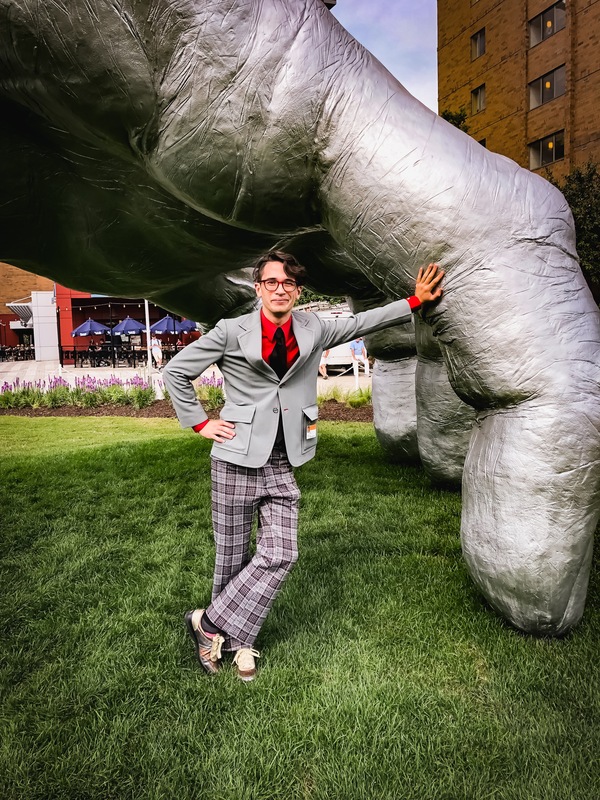 He also served as the Warshawsky Fellow in the department of Education at the Cleveland Museum of Art during the summer of 2018. This summer, JP Peralta ‘19 was awarded the Warshawsky Fellowship at the Cleveland Museum of Art, in the Department of Public and Academic Engagement. He was brought on to share methods he’s learned in theatre to help the education staff develop new, effective ways of reaching visitors and presenting themselves. Much of his time at the CMA has been spent in the galleries discovering and developing those new methods among the day to day visitors. He has been inventing games to play with visitors of any age, and encouraging visitors to engage with the CMA’s world-renowned collection. Using puppets, blocks, cellophane filters, and any crafting materials he can get his hands on, he is constantly innovating, creating, teaching, and discovering. The Warshawksy Fellowship is a nationally competitive fellowship program, generously funded by the Warshawsky family that is granted to only two of the nation’s top art history majors. JP is an undergraduate senior studying Art History and Theatre with a minor in French at Case Western Reserve University (CWRU). He is a proud Cleveland native and lifelong Cleveland sports fan. He has worked at The Sculpture Center on E. 123rd St. as the Ohio Outdoor Sculpture intern, in charge of interpreting, researching, and cataloging all the outdoor public sculptures in Ohio. He was also a voting member of the selection committee for the regional Window to Sculpture 2019 Emerging Artist Series. JP is active in all CWRU student theatre groups, including the student improv troupe IMPROVment, who performed in NYC at the 20th annual Del Close Marathon this summer. He spent a semester abroad studying acting technique at the Royal Academy of Dramatic Art in London, England, in addition to having appeared in professional productions at Cleveland Public Theatre, Dobama Theatre, and CWRU’s own Eldred Theatre. Be on the lookout for details on an upcoming discussion JP is hosting at Tony Tasset’s new piece in Uptown for the FRONT triennial, Judy’s Hand Pavillion. He was recently awarded an opportunity to host a community discussion about the sculpture that will be free and open to the public. The award is from the Baker-Nord Center for the Humanities at CWRU. Oliver Ruhl is a Curatorial Intern in the Photography Department at the Museum of Fine Arts Houston. The MFAH has been a pioneering institution in the study of photography, and a collection of over 32,000 works provides both thorough documentation the art form’s history and ample areas for study. Oliver has spent the majority of his summer working with a set of recently accessioned nineteenth-century daguerreotypes, ambrotypes, tintypes, and early albumen prints. Combining his passions for object-based research and technological innovation, Oliver splits his time between direct, detailed study of works and the use of advanced facial recognition software in order to identify previously unrecognized sitters. He has also had the opportunity to meet with eminent contemporary photographers, create wall labels for permanent collection installations, and perform research for future MFAH exhibitions. Oliver is a soon to be fourth year at Case Western Reserve University (CWRU), studying Art History and Theatre with a minor in Economics. In his time at CWRU, he has worked with Dr. Catherine Scallen as a research assistant, local non-profits such as The Church of the Covenant, and was awarded the Noah L. Butkin Award for best term paper on an art history topic written by an undergraduate. Having spent a semester studying at the Royal Academy of Dramatic Art in London, Oliver can often be found performing at the university’s Eldred Theater. He is the president of IMPROVment, CWRU’s premier short form improv comedy troupe, and a member of the campus all-male acapella group, Speakeasy. In his free time, Oliver enjoys pursuing his own analog photography, cooking, and reading.